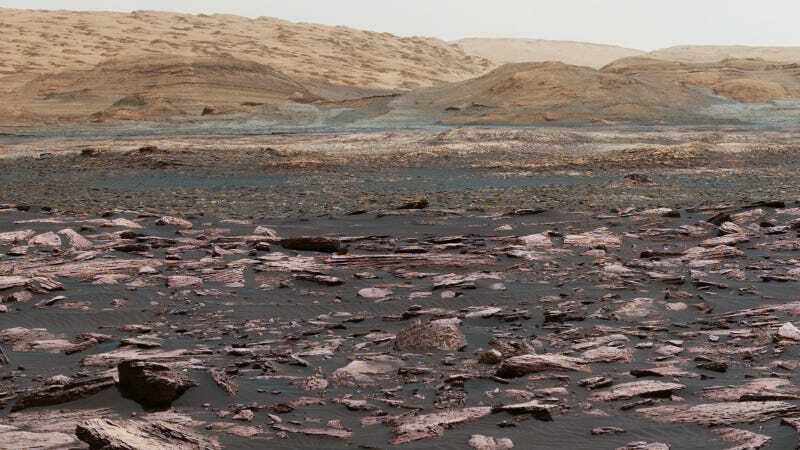 Curiosity is currently roving around Mount Sharp, a 5-kilometer-high (3-mile) mountain in the center of Gale crater. But it’s unclear whether the mountain is the result of the crater once being filled in and losing matter to erosion, or whether the mountain is more like a large dune of deposited material. Curiosity doesn’t possess a scientific instrument to determine the nature of the mountain—but it does have force-measuring navigation equipment. So the scientists got creative. “I realized you can download an app on your phone and, not with much precision, but you can measure [the force of Earth’s gravity] because your phone has accelerometers,” the study’s lead author Kevin Lewis, assistant professor at Johns Hopkins University, told Gizmodo. He figured he could do the same thing with Curiosity’s accelerometers, and perform some interesting science. Measurements of Mount Sharp’s gravity using Curiosity data. It’s not the first time we’ve heard of scientists repurposing navigation equipment to do science—but this is a particularly ingenious one.